In the latest issue of The Casey Report Bud Conrad does a fantastic job analyzing the truth about Asia. Japan is a ticking demographic time bomb. 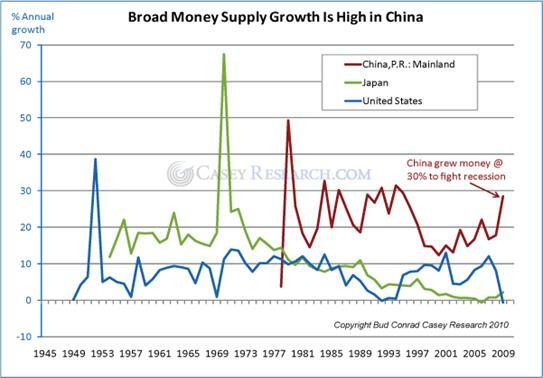 The Chinese government has created the mother of all bubbles and when it pops, it will be felt around the world. The China miracle is not really a miracle. It is a debt financed bubble. Sound familiar? I picked out 4 charts from Bud's article that paint the picture as clearly as possible. The chart below shows that compared to the real estate bubble in Japan during the late 1980s and the current bubble in China, the US housing bubble looks like a tiny speed bump. The US has 20% to 30% more downside to go. For those looking for a housing recovery, I'd like to point out that Japan's housing market has fallen for 20 years with no recovery. I wonder if the National Association of Realtors will be running an advertisement campaign in 2025 telling us it is the best time to buy. Take a gander at home prices in China. Since the 2008 financial crisis, the Chinese housing market has skyrocketed 60%. There are now 65 million vacant housing units. The question is no longer whether there is a Chinese housing bubble, but when will it pop. There is one thing that bubbles ALWAYS do. An that is POP!!! The price of land in and around Beijing has gone up by a factor of 9 in the last few years. Delusion isn't just for Americans anymore. These two charts should be placed next to the word "bubble" in the dictionary. This will surely end in tears for anyone who has bought a house in China in the last two years. As Mr. Alan Greenspan can attest, bubbles can only form when monetary policy and/or fiscal policy is extremely loose. The bubble king supercharged the US housing bubble with his 1% interest rates in the early 2000s. The Chinese must have hundreds of Paul Krugman disciples running their economic bureaucracy. There can never be enough stimulus to satisfy a Krugmanite. The Chinese leaders feel they must keep their GDP growing at 10%. A slowing of growth to 5% would unleash social chaos among the hundreds of millions of peasants who have come to the cities from the countryside for jobs. The chart below shows that when you control the printing presses and the banks making the loans, you can make stimulus "work". In the U.S., the Federal Reserve has printed, but the banks have hoarded their cash and have not made loans. The Chinese authorities have printed and instructed the banks to make loans for shopping malls, apartment buildings, office towers, and condo towers. Average citizens have bought as many as five condos. Every Wang, Chang, and Wong knows that real estate only goes up. Their $585 billion stimulus package was used to build entire cities that sit unoccupied. The 2.2 million square foot South China Mall, with room for 2,100 stores, sits completely vacant. The Chinese have taken the concept of "bridges to nowhere" to a new level. Over a 20-month period, Chinese M2 grew 47%, reflecting the outrageous level of spending by the Chinese authorities. When you hand out $3.5 trillion to developers, they will develop. When a government official, who can have you executed, tells you to lend, obedient bankers lend. The Chinese authorities can hide the truth for a period of time, but the bad debt caused by the Chinese stimulus and malinvested in office buildings, condos, malls, and cities will eventually lead to a monumental collapse in the Chinese real estate market. This will result in a stock market crash and a dramatic slowing in economic growth. The mother of all bubbles will Pop. Only the timing is in doubt. Based on history, the Chinese real estate bubble is in search of a pin.